Successfully Added Car Steering Wheel Bluetooth Kit + MP3 Player to your Shopping Cart. Add a touch of style to your cars steering wheel with this Bluetooth kit MP3 player. This is the best and most affordable way to enjoy handsfree calling in your car, as well as playing your MP3 files though your cars stereo speakers. Whether you're driving through the city or going on a long journey, nothing beats having hands free calling in your car. Having a simple to use Bluetooth kit in your car makes driving safe and fun. This steering wheel Bluetooth car kit also comes with an ear piece that can easily be detached. This is extremely handy as some calls may be private, and you do not wish your passengers to hear what the caller is saying. 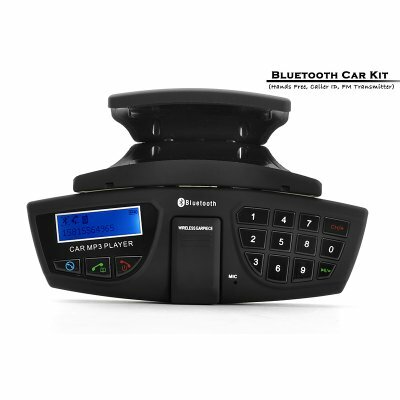 This special Bluetooth car kit come with the most sought after features in Bluetooth devices such as, redial, an easy to use menu system & on-board operational buttons for answering an incoming call, ending the call, volume control, and a speaker switch to alternate between using the units built-in speaker or your cars own speakers (through the units FM transmission function). This Bluetooth car kit also comes with a built-in MP3 player. To use the built-in MP3 player, just insert your TF card that contains your favorite songs into the MicroSD card slot. With security in mind, this Bluetooth car kit can easily be detached from the universal form clamp. This enables you to take the Bluetooth car kit with you when leaving your car. For safe, hands-free call management look no further than this excellent car steering wheel Bluetooth car kit. This Bluetooth car kit comes with a wholesale price tag and makes for a great resale and drop ship item. As always, it is available directly to you from the original source for wholesale consumer electronics, Chinavasion. Have Fun! If you are listening to music being played through the car stereo when a call is received, the music will stop playing automatically to allow you to accept the incoming call. Will this Bluetooth car kit also pair with my iPhone? Yes, this Bluetooth car kit with MP3 player can also be paired with you iPhone. Can I play songs from my HTC Desire through this Bluetooth car kit? Yes, this Bluetooth car kit is also compatible with HTC Desire.